The US Virgin Islands (USVI) were originally inhabited by native Ciboney, Arawak, Taino and Carib people, the islands were claimed for Spain in 1493 and then passed through several hands before settling into the possession of Denmark in 1754. Denmark then sold the islands to the United States in 1916. Though there are numerous islands in the USVI, the main islands in the chain are Saint Croix, Saint Thomas and Saint John, along with tiny Water Island which was not purchased until 1944 when the Department of Defense via the federal government acquired it to protect the submarine base on Saint Thomas. At the time, they paid $10,000 but they sold the island back to the territorial government in 1996 for 25 million! The islands are all nicknamed by locals, Saint Croix is called Twin City, Saint Thomas is known as Rock City and Love City is the moniker for Saint John. The Afro-Caribbean people of the island have shaped the culture and have brought with them the sounds and flavours of their homelands. Quelbe is the style of local music that features traditional African rhythms, forbidden by the slave masters, which the slaves melded with permitted music and dance of Denmark and other European influences. Each of the three larger islands host their own carnival at a different point in the year with celebrations beginning at Christmas and ending in July. This has become the second largest Carnival in the Caribbean. The islands are an unspoiled Caribbean hideaway and the ease of travel for US citizens (if you’re American, you don’t need a passport to go) mean the islands are a popular destination all year round. To find US Virgin Islands villa rentals by owner, for your next holiday, simply select US Virgin Islands as the destination in the “BROWSE BY” tool bar towards the top of the page. If you have set vacation dates use the “AVAILABILITY SEARCH” box, which blends in/out to the right of the slideshow. Alternatively, you can simply browse through the following list of US Virgin Islands villa rentals by owner. 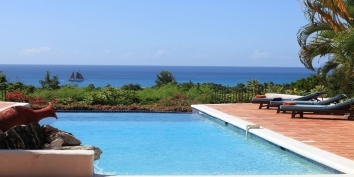 You may also be interested in our slection of British Virgin Islands villa rentals. Come and enjoy this one of a kind, palatial, Mediterranean-style retreat, perched on a beautifully landscaped bluff overlooking secluded Chocolate Hole Bay on the island paradise of St. John, U.S. Virgin Islands. 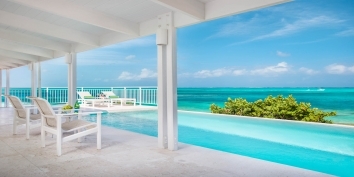 Villa St. John has 6 spacious master bedroom suites with ensuite bathrooms, swimming pool with spacious pool deck, covered porches and absolutely stunning views. A dream come true, this stunning Caribbean villa welcomes you with gentle tropical breezes, warm and delicious sunlight to bathe in, sweet floral scents of the tropics and the soothing music of waves caressing the white-sand beach below. Villa St. John is one of only a few beachfront villas on this exclusive eight mile stretch of utopia. Find out more about Villa St. John, Chocolate Hole, St. John, US Virgin Islands (USVI). Great Expectations, St. John, US Virgin Islands (USVI), is one of St. John's most popular villa rentals for couples vacationing together as well as families with children of all ages. This St. John vacation home has 4 master bedrooms, 4 guest bedrooms, 3 swimming pools, 2 hot tubs and a basketball / tennis court. Great Expectations is located about 100 feet above the Caribbean Sea on the south shore of St. John, less than a 5 minute drive on paved roads to town (Cruz Bay) where the ferry arrives from St Thomas and 10 minutes to the famous, white sand beaches of the U.S. National Park. Find out more about Great Expectations, Chocolate Hole, St. John, US Virgin Islands (USVI). Three Palms Villa, St. Thomas, US Virgin Islands - perched just 100 feet above our expansive ocean view, it’s no wonder that guests have described the villa as “180 degrees of pure paradise” and “the best view on island”. With five spacious bedrooms and ample living space, Three Palms Villa is a perfect venue for families and friends to gather for a special vacation, anniversary, family wedding or reunion. This USVI vacation villa rental has a secluded feel within our gated community, yet it is centrally located, and just minutes away from all of the wonderful activities awaiting you on St. Thomas. Including the world renowned Magens Bay Beach. 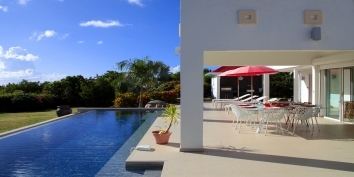 Find out more about Three Palms Villa, Peterborg, St. Thomas, US Virgin Islands (USVI). Is your US Virgin Islands villa already unique on CARIBIQUE? If not, find out how to list your Caribbean villa now!